Thanks for this -- I wasn't aware of the book you link by Lawrence Brown. I wonder if the more middle-brow Tom Cahill's How The Irish Saved Civilization owes Brown an intellectual debt? 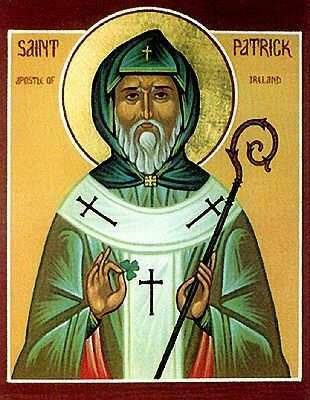 Living in a city that literally dyes the main river green for the holiday, it is good to be reminded of the spiritual importance of Saint Patrick! I believe modern monastics make use of our modern computers and efficiency as part of working with their own hands. You make excellent points here, Paul, about the contribution of the monastics to the physical and economic state and recovery of the West. One thing worth thinking about is that, while the monks may have sworn off individual wealth for themselves, they by no means failed to understand the importance of human and physical prosperity for mankind as a whole. They understood that the things of this world were not, per se, an invitation to greed. In this sense the English monks, at least, were not ascetics in the same sense that the desert fathers were ascetics. They made monasteries that managed their property well, raised crops, and had sufficient "extra" to give to the poor. I believe that a significant share of the modern contempt for monasteries stems from the early modern perception - instantiated perfectly by Henry VIII in his theft of monastery properties - that the monasteries were an unnatural (i.e. objectionable) form of wealth-gathering. There were, I suspect, at least 3 factors that led to this perception. One is that property - land - could be given to a monastery as a donation, a charitable act, a penance for sins, for giving glory to God, but it could NEVER come out. It was a permanent one-way street for THAT form of wealth. And in pre-industrial times, land was the primary source of wealth. Another is that SOME monasteries ended up effectively as landlords, and potentially in competition with other land holders, but without the "normal" competitive factors. They held the rights to labor from serfs, but (just as an example) they did not hold the same obligation to defend those serfs from attack: they could and did employ soldiers, but the monks could not themselves lead a charge in battle. The third is perhaps the most critical, though least consciously grasped: a monastery could not be a permanent economically self-sufficient organization. It could only receive as its members those who started life outside the monastery. They were inherently were dependent on an outside world to make it "go" as a successful entity. This is unlike a village or city. A monastery cannot be conceived as an "organism", only as an organ in a larger society. As such, they must bear a close relationship to the larger society, a relationship which, if it became skewed or became misunderstood, could be perceived as a parasite. That relationship could become warped, for example, if the monastery ceased to be primarily ordered toward an ascetic ideal, an ideal that looks to a life beyond this life and to which we can only bring our souls and our character, and became focused on this life. In doing so, the potential for being seen as in competition with ordinary land holders would kick in overdrive, the rationale for their special prerogatives would cease to be meaningful. As Henry thought with their tax exemptions. But at root, and in the ideal, a monastery was an engine for organizing a modest body of men or women toward a life of prayer, toward the contemplative life. As such, its avowed purpose could never be the common purpose of all men and women, for society needs most men and women to devote themselves to raising families. In those (relatively few) monasteries that had a sufficiency of donation - including initial grant - to manage without providing for themselves, their labor was always in part a break from prayer and in part a gift to God and to the larger community (in such forms as taking in travelers, or taking care of the sick, or production of books). In more common situations, the monks had to work at least partly for their own upkeep, and it is in these that Paul's comments hit home the most: in these stable communities men could commit part of their labor for tomorrow's benefit and another part for next century's benefit. There is something empowering in laying bricks for a building you expect to be here in 2 centuries, devoted to the same constant purpose, rather than putting up a building you are confident will be torn down in 60 or 80 years as decrepit. And the management of human productive capacity with a view to centuries ahead rather than only weeks or seasons ahead helps teach us to view that human productive capacity for what it is, a gift from God for the betterment of many, not just for me. There is something empowering in laying bricks for a building you expect to be here in 2 centuries, devoted to the same constant purpose, rather than putting up a building you are confident will be torn down in 60 or 80 years as decrepit. And the management of human productive capacity with a view to centuries ahead rather than only weeks or seasons ahead helps teach us to view that human productive capacity for what it is, a gift from God for the betterment of many, not just for me. A while back, there was a discussion here about property taxes and I think the form of taxation society depends upon plays a role in this. Property taxes treat existing property as a fact and a resource that can be constantly tapped as needed by the authorities. They have little regard for human need, the natural cost of upkeep, etc. Income and excise taxes are the exact opposite in philosophy. They can only be claimed as people generate new wealth or engage in sales. In my view, a tax model that treats property like something that can be hit up ever year is intrinsically short-sighted in its view of property. It might be not destructively short-sighted, but it's hard to argue that property taxes promote a activity except in the negative sense of scaring people into producing so the government doesn't take what they've already accumulated. Jeff -- the Lawrence Brown book is a work of wide-ranging and eccentric genius, well worth reading if you can track down a copy. I can't imagine even a conceivable reader who agrees with every argument advanced by the author, but the challenge of his fierce independence of mind rewards the work and occasional frustration.